Rams nearly lose homecoming game, rally for OT win. 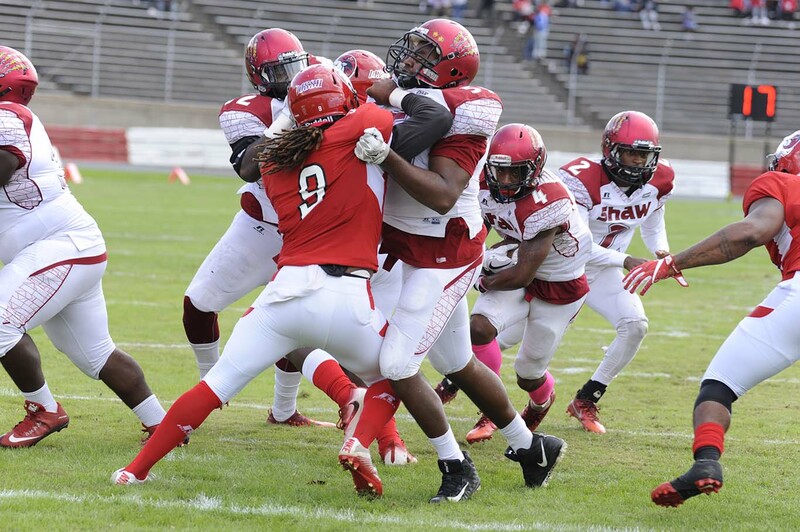 Shaw University (3-6) nearly pulled off another CIAA South spoiler at Winston-Salem State University, but a repeat of 2015 wasn’t in the books on Saturday as WSSU (6-3) won 27-21 in overtime. With 10 seconds remaining in the game, Shaw’s Beni Kinsemi missed a 50-yard field goal that would have won the ballgame. What will stick in the Bears’ guts for a long time is the field goal should have been a 40-yarder. Shaw jumped offsides on two consecutive plays pushing their kicker back into NFL territory. In overtime Kinsemi missed another field goal attempt for the Bears, giving the Rams a sudden death opportunity. Jahiz Linebarger sealed the deal for WSSU on a 20-yard touchdown run for the final score. All three contenders in the CIAA Southern Division held serve on Saturday. Fayetteville State survived a close encounter at Livingstone, while Saint Augustine’s pitched a shutout against Johnson C. Smith. The Rams still remain in the hunt for another Southern Division championship but they’ll need some help from the team they just sent back home to Raleigh. A win over Fayetteville State at home next Saturday coupled with a Shaw victory over St. Augustine’s will give WSSU a chance to go for the CIAA threepeat in Salem. FSU is the only Southern Division team to control their own destiny, win and they are in. Should both SAU and WSSU win next Saturday, then the CIAA tiebreaker will come into effect. Both the Rams and Falcons would have identical divisional and conference records, 4-1 and 5-2 respectively, but SAU would have the head to head advantage. Fayetteville State would be the odd team out with a 4-3 conference record should they lose.